The Nitro represents Dodge’s first foray into the five-passenger, mid-size SUV category. Famous for their pick-up trucks, the Dodge brand introduced its first SUV, the Nitro, in 2007. Available in three model designations: Heat, Detonator and Shock trim levels, the Nitro concept is based on the Jeep Liberty. 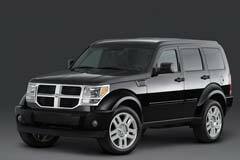 The Dodge Nitro is characterized by muscular fender flares, a chrome Dodge crosshair grill and eye-catching cast aluminum wheels. The 3.7-liter V6 petrol engine mated to a four-speed automatic transmission can go from 0-60 mph in just 9.6 seconds. The interior of the vehicle is both functional and flexible for people and cargo. Red accents carry over to the interior, bottom of the dash, door panels as well as the seat inserts. The interior features an attractive silver satin center with ergonomic controls, audio system and a 7-inch display screen for the navigation system. The front passenger and rear seats can be folded, thus allowing ample cargo capacity. 2011 Nitro Heat ilver Dodge Nitro with 103,495 Miles available now!